By default the AeroFS logo is displayed on the web portal. 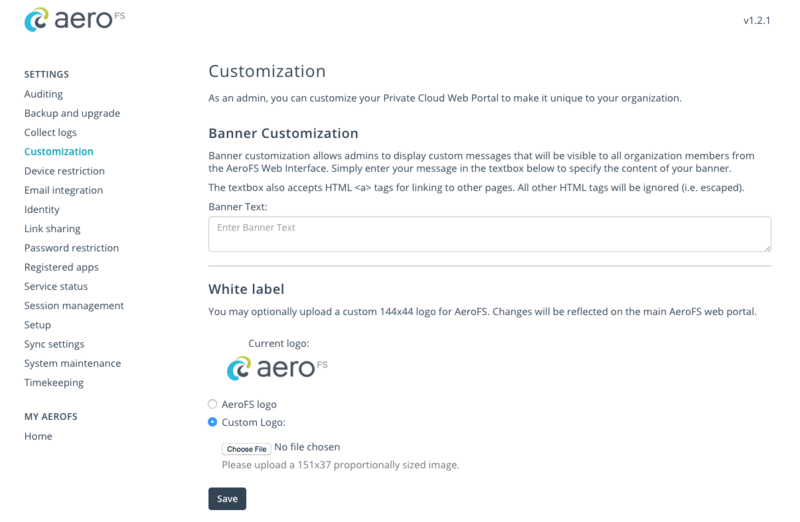 As an admin, you can customize it to make it unique to your organization and display your logo in place of the AeroFS logo. Please follow the steps below to make this white label customization. Go to your Appliance Management Interface. Click on Customization in the left navigation panel. In the White Label section, select Custom Logo, then click Choose File to upload a new logo. The new logo should be a 151x37 proportionally sized image. This feature is only for the AeroFS Business plan. If you'd like a free trial, please contact our Sales Team. How Do I Obtain a Signed Certificate and Key for My AeroFS Appliance?